King of Aragon (1196-1213). Inspired with a desire to receive his kingly crown from the pontiff himself, he journeyed in 1204 to Rome, where Pope Innocent III. crowned him with his own hand and received his oath that he would be faithful and obedient to the Roman Church, and that he would protect the Catholic faith and persecute the heretics. The knights and barons were much displeased at what the king had done, and the Jews of his land were filled with anxiety and terror, being afraid that they would be driven out of the country. Upon his return (Dec. 24, 1204), which fell on a Saturday, as the Jewish chronicle rightly states, the Jews, probably those of Gerona or Barcelona, advanced to meet him with the Torah roll, as was customary on state occasions, and ordered a general fast-day. But their fears on this occasion were groundless. 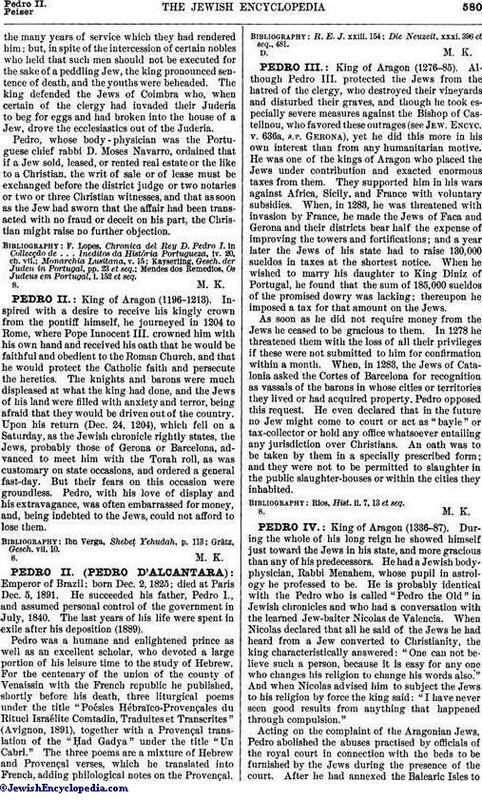 Pedro, with his love of display and his extravagance, was often embarrassed for money, and, being indebted to the Jews, could not afford to lose them.